Vietnam - Laos & Cambodia Tours - Indochina instyle is the ideal tour for kids and adults. Combining outdoor activities, cultural touring and an overnight trip to homestay this 17 days trip is fun for all ages. Welcome to Luang Prabang! Your private guide and van will meet you at the arrival gate and transfer you to your hotel for checking in after your completion of all necessary immigration requirements. Start your journey with the city tour (either by bike, tuktuk, or van) at the former Royal Palace (now the National Museum).. Continue your ride to Wat Mai, a temple renowned for its golden bas-relief, and Wat Sensoukarahm which features a beautiful dazzling golden façade. Spend some time at Children Culture Centre (CCC) where children are taught not only in arts and culture but also how to live a better life. In Luang Prabang, the CCC offers free of charge activities such as traditional dances, music, singing, drawing, puppetry, painting, reading, storytelling, games, and handicrafts. End your first day with a favorite traditional game of Petanque with the locals. Your playmates and audience will cheer you up and give you hints to improve your games. Enjoy some snacks and drinks in between the games before your special Laotian dinner with the food you need to grill by yourself at Sindat Restaurant. After dinner, take a stroll through the night market which rests on some city streets. Dozens of vendors come to sell their products which include handicrafts, clothes, souvenirs, and house wares. The friendly atmosphere and beautiful goods make it one of the best places to shop in Laos. Overnight in Luang Prabang. Optional: For early risers, there is a special dawn visit to watch long lines of orange-robed monks leave their pagodas on barefoot down the streets to collect offerings from Luang Prabang residents. The beautiful, serene ceremony highlights the spiritualism of the Laotian people. Return to the hotel for breakfast. Pick up at your hotel for a short transfer through the Luang Prabang countryside to Kuang Si Waterfalls (32 km to the southwest of the city). Along the way by the Mekong River with various viewpoints, you will witness gorgeous landscapes of many rice fields, hills, and villages. An opportunity for you to learn about the traditions and culture of an ethnic minority at a village where the local people have remained their culture unchanged for centuries. Afterward, take a book party at Big Brother Mouse - a non-profit charity organization which provides Laotian children with free libraries and access to reading materials at any of its centers in Luang Prabang and Vientiane. Most children in Laos have never seen a book other than a textbook. Tourists are welcomed to Big Brother Mouse’s centers and to make their donations of reading materials to remote villages. Before dark, climb 328 steps to the top of Mount Phousi to enjoy a panoramic view of the city and the surrounding countryside. A simple, yet charming café The Blue Lagoon (highly recommended for dinner) serves a large collection of delicious local and western dishes which can surely meet your whole family’s expectations. The National Museum at the former Royal Palace, which displays a lovely collection of the artifacts reflecting the richness of Lao culture dating from the days of the early kings right through the last sovereign, and the Central Market are not to be missed. After visiting these sights in the morning, you will have free time for your own exploration of the town and strolling around the shopping area. The tour ends after your transfer to the airport for an afternoon flight to Hanoi. Upon arrival in Ha Noi, your guide and private car will meet you and transfer you to your hotel. Vietnam’s quaint capital is a city of wide tree-lined boulevards, beautiful lakes, colonial buildings, wonderful museums, and rich culture. Ha Noi has much to offer, and you can’t leave it without wishing to have some more days (if not more) to explore this city of a thousand years old. • Stop at Phu Tay Ho: The temple, perhaps the most popular place to worship in Ha Noi, was built in the 16th century to worship Mother Goddess, to whom the temple is dedicated. • See Buddhist pagodas such as Tao Sach Pagoda, Kim Lien Pagoda. • Stop for a cup of coffee and/or tea by the lake. You have now seen much of the west lake and some of the city of Ha Noi. There are some minutes for you to witness the beauty of the lake again. The west lake is also a place many national kayaking athletes use to practice for their next tournaments. • Admire beautiful Vietnam national flower – lotus if you are biking in Ha Noi in the summer. The full day tour commences with visit to Ho Chi Minh’s Mausoleum, His House on Stilt, One Pillar Pagoda, Tran Quoc pagoda followed by Van Mieu – Temple of Literature. Lunch at a local restaurant. 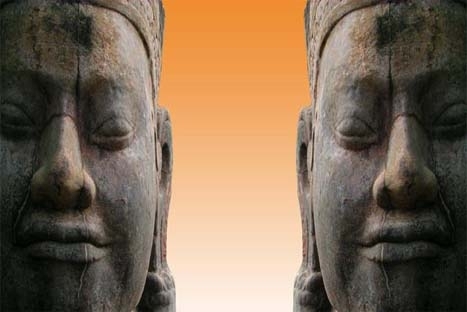 In the afternoon, discover more of Hanoi with the visit to Ethnology Museum of Vietnam. Return to the Old Quarter of Hanoi for walking around the old streets and stop to visit Ngoc Son temple then enjoy a Traditional Water Puppet shows at Thang Long Theater. In the evening, you will take a night train to Sapa. Arrive at Lao Cai Train station at about 6.30, welcome by our local guide and take a ride to Sapa. Have breakfast and relax before exploring Sapa Town. In the afternoon, take a 2km trek to Cat Cat Village, home of H’mong Ethnics. Meet & talk with locals to learn more about their daily life. Then continue the ride to Tafin village (12km from Sapa) home to the Red Dzao minority. Visit Tafin Cave, Tafin handicraft shops and explore the daily life of Red Dzao. Here you have good choice to buy woven and textile brocades, which are hand made by ethnic people. Visit a small hamlet of Black H'mong people here too. Overnight at your hotel in Sapa. Breakfast at hotel and check out at around 9:00-10:00am. You’ll use a private car to visit Lao Chai village of Black H’mong people. Then trek a little to visit Ta Van village of Dzay ethnic people. Drive back to Sa Pa for lunch at your own arrangement. A short shopping in town before moving to Lao Cai station. Dinner at Lao Cai. Have a train trip back to Hanoi. Overnight on an AC 4 berth soft sleeper train to Hanoi. Arrive early morning (around 05:30-06:00) in Hanoi). You will be transferred to a local restaurant for breakfast. 08:30am leave Hanoi for Ha Long bay. After 03 hours and a half drive we arrive in Ha Long bay, a World Heritage Area of outstanding natural beauty. Upon arrival, transfer to a junk for a cruise around Ha Long Bay with a delicious local seafood lunch served on board. The cruise passes by many rocks and islets in many funny shapes. Again your dinner served on board. In the evening, enjoy the night fishing (optional) and later overnight on board. In the morning, your breakfast or brunch will be served while doing further cruise to explore the beauties of the Bay before returning to the Wharf. Disembark around 10:30-11.00am. On return, before heading to Noibai airport we take a short stop at Dong Trieu Ceramic Village. Arriving in Phu Bai airport, you will be greeted by our guide and transferred to Hue for overnight. In the morning, join a half day cooking class, we follow Mrs. Cuc, the owner of Y Thao Garden House to Dong Ba central market, where she gives an instruction on how to choose food for our cooking lesson at 9:30 a.m. at Y Thao Garden House. Afternoon take a cyclo rise to visit the Imperial Citadel and time then on is free for relaxing. Overnight in Hue. Today we will heading to Hoi An through Hai Van pass, and Lang Co beach – one of the most beautiful beach of Vietnam. Upon arrival, check in hotel then discover Hoian truly life. Walking tour around this enchanting port town. Follow the narrow lanes lined with centuries-old houses influenced by Chinese, Japanese, French and European architectures and visit its numerous places of interest: the 400-year old Japanese Covered Bridge, the Phuc Kien Assembly Halls, the local fish market… Around the town we can see a numerous art galleries and tailor shops, get some made-to-order clothes if you like. The next tour is coming to the home of a craftsman in the old streets. Here you will have a brief introduction to the history, shape, and color of the lanterns as well as the many stages of making them. After that you can make your own lantern, decorate, pack and keep it as a souvenir during the time in Hoian. Have lunch at the local restaurant. Overnight in Hoi An. • Morning pick up your at hotel by bicycle (In case of not being able to bike, van can be used to go as an option. • Meeting the local farmer, talking with them about their local farming daily life, having a cup of tea with them at the middle of the rice paddle field farm. • Listening to the tour guide introduced and explained about the process of the wet rice how to grow it. • Starting the farming works to learn how to grow wet rice with water buffalo plough, use agricultural water system. • After lunch, say goodbye to your hosted family and return to your hotel. After breakfast at your hotel, you will be free until being transferred to the airport for an afternoon flight to Ho Chi Minh City. Overnight in Ho Chi Minh City. You will then drive to Wildlife At Risk (WAR) which is dedicated to protecting the biodiversity of Vietnam by combating the illegal wildlife trade, raising environmental awareness and promoting the conservation of endangered species and their habitats - an sustainable tourism center. Child would love this center. Return to Ho Chi Minh and free in the afternoon. Overnight in Ho Chi Minh City. Depart early in the morning. Upon arrival at My Tho, take a boat to Con Phung (Phoenix Island) at a Mekong River estuary. Stop at a garden restaurant for lunch. 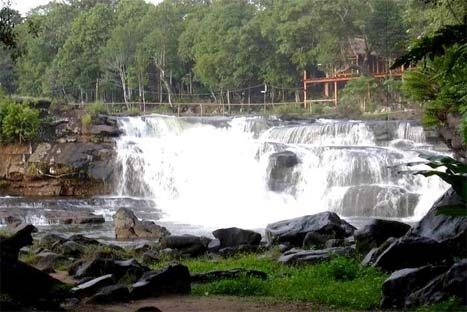 Then cruise along natural creeks and quiet villages in Ben Tre Province. Visit orchards, bee farms, taste natural honey, honey wine and tropical fruits, listen to local music, visit a distillery and a local coconut candy maker. You will drive straight to Tan Son Nhat airport in Ho Chi Minh City for a flight to Siem Reap. Our car and guide will pick you up at the airport then transfer to hotel for check in. Dinner at local restaurant with Apsaras Dance show. Overnight in Siem Reap. Visit the Angkor Thom (big Angkor) - 3km2 walled, of which South Gate of Angkor Thom, Bayon - the giant stone faces with 37 standing tower 4 carved faces, Baphoun - huge temple - mountain in the heart of Angkor Thom, Terrace of Elephants - 2.5m tall wall, the heart of Angkor Thom in front of Baphoun and Phimean Akas, carved elephants and giant graduals, Terrace of Leper King - a double terrace at the north end of Terrace of Elephants with deeply carved, demons and other mythological being and Phimean Akas temple. Lunch at local restaurant. 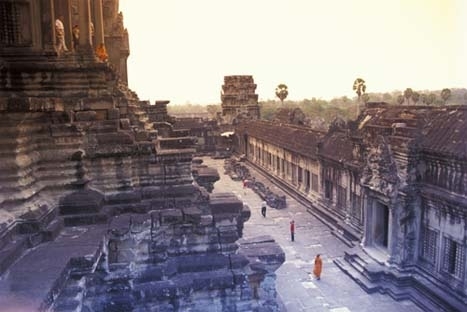 Follow is the tour visit the famous Temple of Cambodia, Angkor Wat, and it's visually, architecturally and artistically breathtaking. It's massive three tired pyramid crowned by five beehive-like towers rising 65 meters from ground level and this temple is the centerpiece of any visit to the temple of Angkor. Enjoy the Sunset from top of Bakheng Hill. Overnight in Siem Reap. Breakfast at hotel, you will be free for relaxing or shopping until transfer to the airport for flight off.